Palace of Swords is an experimental electronic ambient project based in Aberdeen, Scotland and led by Peter Lyon. I was first introduced to them through Fruits de Mer Records (once again! ), when their Neu! cover "Lila Engel" was included on the superb Krautrock tribute compilation Head Music in 2012. 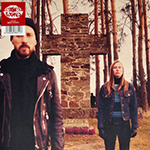 Palace of Swords have released a couple of hyper limited CD-R EP's on the amazing Reverb Worship label, who have now also started to put out 7" singles which is great! This white-label, white vinyl 7" includes two remixes. On the first side (marked with A) we've got a very hypnotic and minimal "Echoes from a Distant Star" re-mixed by Joe Foster, the legendary producer and co-founder of Creation Records, among other things. There's not that much happening except for a simple, repetitive synth pattern and some electronic background noises, but the vibe is very cool. "Ringstone Round" on side AA has been remixed by another Reverb Worship artist The Hare and the Moon, and I like this version a lot. There's even some human voice in the pretty adventurous mix. This is still rather minimal, peaceful ambient music. This track was previously known as "The Castle Spectre" and die-hard Fruits de Mer collectors like myself have heard it on their exclusive The Crabs Sell Out / The Crabs Freak Out compilation. The 7" comes with a CD-R that has the two single tracks ("Ringstone Round" is extended here) plus three other tracks. "We Are the New Hyperboreans" has a very cool title I think and is remixed here by Midwich Youth Club. Pretty trippy electronic music! The same goes with "Aesthete Cured" (Snide Rhythms Re-mix", but this relays more on beat and melody. "Live at the Aberdeen Witch Trials 1597" (Future Disguiese Re-mix) is a very weird, psychedelic and experimental track that also has very suitable spoken-word samples. All in all, this is an interesting and mind-altering release so check it out if you can still find a copy since there are only 100 of them! Lunar Miles Band is a new heavy stoner rock group from Lappeenranta, South Karelia, Finland. They were formed in 2014 by guitarist/singer E. A. Miles with drummer Mike Stetson and bass player Ade Venäläine. This is their first release and the band has also been active on the Finnish heavy stoner/hard rock/doom live scene playing gigs with bands like Seremonia, Earthbound Machine, Deep Space Destructors etc. This CD EP includes five original tunes written by E. A. Miles and rocks pretty hard. Groovy, heavy riffs, tight rhythm section, suitable, a bit harsh but melodic vocals and punchy, good sound so all in order here. Personally, I would have used some more effects, especially on the vocals that are now pretty clean. Musically this is pretty usual heavy hard rock / stoner rock and not really that spacey or psychedelic, and there are no actual guitar solos which always is a bummer for me particularly in this kind of music. The songs still are interesting enough so not bad. I think I can hear some Monster Magnet in there but perhaps also some grunge or something. They already have a new three-track EP in their Bandcamp site and it's also available on tape. I'm not sure if you can purchase this first EP since it not even listen on their Bandcamp site but you can always ask the band! 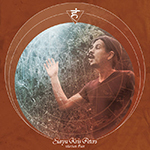 Surya Kris Peters is a cosmic solo project by Samsara Blues Experiment guitarist/vocalist Chris Peters from Berlin. He uses lots of synthesizers, Fender Rhodes, electric organ, guitars, Irish bouzouki, sitar, harp, reed organ, gong, Tibetan singing bowl, bohran and rhythm machines etc. 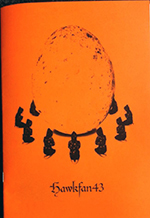 to create peaceful, meditative and deep "music for the higher spheres", as he truthfully describes it. Status Flux was recorded occasionally during 2014 and 2015 and is the first album by this project and so far only available digitally from Electric Magic's Bandcamp site. The album includes eight instrumental pieces that soothes your soul and rise your spirit up into the sky and space. Some of the tracks have obvious Eastern vibes, and I like the way Peters combines electronic music with ethnic, acoustic instruments and guitars. The longest piece is called "Passage to Another World", and that's a very suitable title. I really enjoy the tranquil, evocative and transdimentional mood on this release. You just need to lay down, close your eyes, and let the music carry you to other, new and wonderful places in the multiverse. This is a great way to relax and regain your strength in this way too stressful, busy and chaotic world of ours. If you like this album, also check out his previous acid folk solo project Soulitude that can be found at Electric Magic's Bandcamp site as well. This is the fourth album by this very cool, groovy, soulful and funky psychedelic garage rock band from Switzerland. I don't sadly own their previous albums, but this new one released by Germany's Stoned Karma Records makes me feel like living in some weird, lysergic 60s B-grade secret agent / sci-fi movie. And I love the vibe! Track titles like "Take Me to Your Leader", "Planetarium Part I & II" (including cool spoken samples), "Dive into the Mathmos" and "Holy Smoke" probably give you and idea of the mental state these guys are in... The band is: Mario Janser (electric organ), Gerry Germann (guitars), Robert Ebler (percussion), Stefan Saurer (drums) and Rolf Keller (bass). Their superb instrumental music really has a strong 60s vibe, but the sound quality is modern and excellent. I really like the ultra-cool Hammond organ, fuzzy guitars and steady rhythm section, and the percussion player takes the groove to another level. These talented guys know what they can do with their instruments. Most of the eight songs are rather fast and make you want to dance (or chase the bad guys/escape the bad aliens etc. depending on what level you are on), but there are a few slower ones in there as well for a good balance. I am often reminded of Finnish band The Hypnomen, they must have some similar influences. 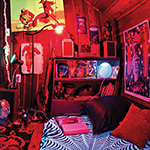 Claw isn't hyper spaced-out or trippy, but it certainly has a strong psychedelic mood. I really can't tell what the highlights are since I like all the tracks very much. The album is available on vinyl, CD and as a download from their Bandcamp site and I think you own it to yourself to get a copy. 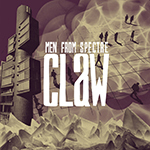 The Claw by Men from S.P.E.C.T.R.E. 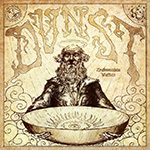 This is the second album by German psychedelic stoner rock heads Dunst. The members also have other interesting projects like Vintage Cucumber and Weedruid, so check them out too. Archimedes Waffen was released on vinyl last year, but is now also available on CD. The album features seven long, instrumental, atmospheric and adventurous tracks of great progressive, psychedelic stoner rock in the vain of Colour Haze, Samsara Blues Experiment, My Sleeping Karma (just listen to the first two tracks) etc. Some of the more mysterious, mesmerizing tracks, especially the excellent "Dhimahi Prachodayat" and "Agathe & Saturnia" also bring to mind the first album by Liquid Sound Company. The album was recorded in Berlin in 2011 and features mostly just guitar, bass and drums, but one guy is listed on vocals and effects as well. I can hear some sound effects/keyboards, but no actual vocals. "Hammerhigh" is one of the most energetic tracks and reminds me of Karma to Burn. This is very enjoyable stuff and a great album as a whole, also what comes to production. I like the way these guys play, and they have good taste in music style, so why don't you have a listen as well! I really loved what the North American stoner rock gods Monster Magnet did with their latest album Milking the Stars: a re-imagining of Last Patrol. That was a re-make of their latest studio album Last Patrol originally released in 2013. You can check out my review over here. Now they have done exactly the same, more psychedelic, alternative universe treatment for their 2010 album Mastermind and the results are stunning. Compared to the the original album, there are now only ten tracks instead of twelve, the track order is almost completely different and the titles are now often slightly changed. The band obviously had lots of fun doing re-writing, re-recording and re-arranging and making most of the songs pretty different in structure and mood. This sounds like a brand-new album and a really great one too! The old "Dig That Hole" has turned into "She Digs That Hole" and starts off the album in a great, dirty way. "Watch Me Fade" was originally just a bonus track, but here it's the second song and I really like this organ-driven, garage rock styled version of this rather melodic track. "Mastermind '69" is really psychedelic and hypnotic now with all the sitar, organ and fuzzy guitar... I love how the track grows and blows your mind. Another, even more trippy highlight is the over 9-minute-long "Cobras and Fire (Hallucination Bomb)" that's pretty atmospheric with some Mellotron, acoustic guitars etc. Excellent! The peaceful, dreamy and chilled-out version of "Gods and Punks" now entitled "Gods and Punks and the Everlasting Twilight" sounds rather different here without any drums or heavy rhythm guitars. 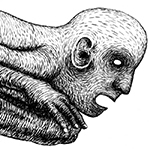 "The Titan Who Cries like a Baby" has been shortened into "Titan", and this is very atmospheric, a bit spooky, almost ambient stuff with piano, orchestration and weird sound effects... "When the Planes Fall from the Sky (Sitar and Psych Version)" rocks out in the heavy, doomy Black Sabbath style like it used to, and this is perhaps the least altered song but still more psychedelic. The Temptations cover "Ball of Confusion" is fast, pounding, heavy space rock in the vein of Hawkwind, so of course one of my favorites... I guess this is sort of a replacement for the fast rockers "Bored with Sorcery" and "100 Million Miles" on Mastermind. 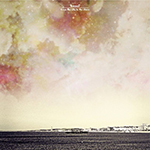 The instrumental "Time Machine" cools things down again with piano and peaceful guitar sounds and effects. The album is finished with the long "I live Behind the Paradise Machine: Evil Joe Barresi's Magnet Mash Vol. 1", and things get really psychedelic and weird now... What a trip! This album is a must-have for all Monster Magnet fans and works really well on its own, so you don't even need to have heard the original Mastermind to dig it. The album will be out next month, personally I can't wait to get the limited red 2LP version with a cool slipmat! Seven That Spells is a Croatian band that started out over ten years ago a bit in the stoner rock vein but soon got weirder and more experimental when they discovered Acid Mothers Temple and played and collaborated with them for a while. AMT have definitely been a big influence lately, but STS still have gone deeper into a direction of their own. They flirt with krautrock a lot, but in reality they make much more noise that ten kraut bands put together! Their sound can usually be described as a psychedelic, hypnotic and chaotic wall of sound. Their progressive/regressive music is usually mostly instrumental with just some mantra-like chanting and stuff like that. This particular album is their eleventh and originally released on CD in 2012 and now sees a limited vinyl release on Sulatron. Kawabata Makoto from AMT is playing some freaky electric guitar like only he can, and there is also some sax and even piano on the album, but mostly just guitar, bass and drums. There are three long tracks on the album. The first two have been edited for this vinyl issue. "The Wall" starts off with some complex, energetic poly-rhythms and chanting. Later on some chaotic guitar terror is added on top to a create effect. "Pyramid" sounds at first a bit like 90s King Crimson, but has lots of wild, noisy guitar on it too. "The Colossus" is the longest track at 21:43 and perhaps the most pleasant to the ears, although the guys really start to freak-out towards the end... Some free jazz vibes in there as well, I guess. The last minutes are very peaceful, thank God! This album will remove the wax from your ears and blow your mind, guaranteed. 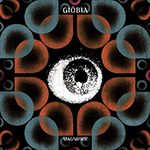 Italian psych rock band Giöbia has gone into heavier and darker direction on their new masterpiece album Magnifier. I really enjoyed their previous full-length Introducing Night Sound that was released on vinyl and CD by Sulatron Records in 2013 and also have their one 7" EP but I have not heard any of the CD-only releases. They used to be more psychedelic garage rock oriented, but especially on this new album they get into heavy psych and space rock with a blast. The first track "This World Was Being Watched Closely" uses cool sampled narration in a clever way. The music is hypnotic, psychedelic and rather heavy too, and starts to rock more in the Hawkwind style after a couple of minutes. Great! "The Pond" is another killer, fuzzy heavy psych track sounding a bit like The Cult of Dom Keller. "The Stain" is slower stuff with more keyboards and organ but its also very powerful and pretty heavy and gets faster later on. I'm loving it! "Lentemente la Luce Svanirà" is a hyper hypnotic and dark track bringing to mind bands like Dead Skeletons, wow... "Devil's Howl" is the shortest track at 3:12 and possibly also the heaviest with some stoner rock vibe. "Sun Spectre" is the longest piece of the album and lasts for 15 minutes... This is very trippy and experimental stuff including long, groovy and hypnotic parts that force you to dance in ecstatic trance as well as some floating, ambient passages. 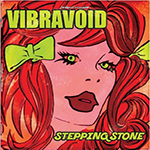 The album is finished with the title track "The Magnifier" that is a great, more traditionally constructed, melodic psych rock song not that far away from the vibe of Vibravoid. What an excellent album with no fillers, absolutely one of the best albums this year! This really is pure psychedelic dynamite and every fan of heavy, spacey psych rock should get a copy. These are the last two releases by this great, spontaneous kosmische krautrock band that was formed accidentally in 2011 by German space/psych/kraut/rock luminaries that also play in bands like Electric Moon, Pancakes, Zone Six etc. 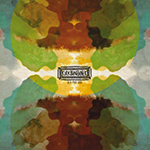 Spiritual Retreat was actually their first improvised recording in 2011 but mixed and released this year after one full-length album and one split LP with the amazing Lamp of the Universe. This new/old album was released only on vinyl and limited to "777 divine copies". The album is comprised of just one massive, spacey and trance-inducing jam lasting for almost 44 minutes and just divided into two parts for the vinyl. The sound quality is perhaps not the best possible, since the recording was not absolutely hi-fi in every way, but this still sounds very good after the mixing and mastering. What's more important is the totally out-of-this-world vibe this album offers... It most definitely takes you someplace else! This is very hypnotic, cosmic, tribal, psychedelic and rather laid-back stuff reminding me of some of the more ethereal and spacey krautrock legends of the past like Amon Düül II, Ash Ra Temple etc. and I just love it! The instrumental, wholly improvised music is made with synths, drums, bass, guitar and organ, and that's all you need for a brilliant mind-journey. A must-have for all collectors of cosmic vinyl candy for sure. For those of you who don't own a vinyl player or just are on a strict budget or something but still want to play some superb kosmische music The Complete Works 2CD is like heaven-sent. As the title suggest, this release includes all the band's works in one jewel case. First, we've got the three long tracks from Kosmische Rituale, a limited coloured vinyl release that I have previously reviewed here. 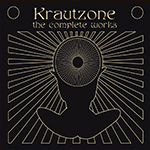 Even if you are lucky enough to have all the Krautzone vinyl, this double CD is worth buying for the previously unreleased, celestial bonus track "Schwebung" that ends the first disc! 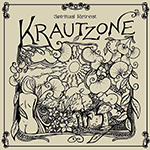 On the second disc, there are first "Superkraut I" & "Superkraut II", the both long Krautzone tracks from their marvelous split LP with Lamp of the Universe that I have also already reviewed here. Then there is "Spiritual Retreat" as one, very long and trippy track... Whoaah! Just put this 2CD on if you want to float in space for about two hours! It comes with a very nice booklet with album art and info. Warmly recommended. I've been aware of this Finnish doom metal band since their first demo The Witch Comes Back to Life in 2004, but haven't really followed them actively. It was a big surprise to me that they sounded really different late this summer when I saw the trio in Turku. Sure, there were some heavy, slow and doomy stuff in there as well, but the set started with lots of high-energy psych rock instrumental jamming in the vein of Earthless etc.! I really enjoyed their gig, and that reminded me that I had received a digital promo kit of their latest album from Svart Records earlier this year... I've been so busy that most of the promo downloads are just laying around in cyber space and completely forgotten, sorry about that. Anyway, I downloaded the album and will write a short review now, even if I'm way too late. The new album includes just four tracks, but the fourth one takes the whole side B of the vinyl version. The opener "Fleeting Are the Days of Men" is the shortest track at 5:35 and maybe closer to their old style being quite slow and doomy. There are melodic harmony vocals which I almost always prefer over harsher screaming etc. even in doom metal. Somehow the riffing reminds me of The Obsessed or Revelation having some progressive elements as well. The track turns seamlessly into toe more peaceful "Summer's Isle". In the middle the track speeds up a bit and we get some jamming and guitar soloing as well, great! "Desertshore" is at first slower stuff again, but starts to rock out more later on. Then it's time for the almost 20-minute "The Sleeper, including Being Is More than Life" that begins with some church bells and bird-song. This is a very atmospheric and pretty laid-back track with some more melodic harmony vocals at times and it also gets more jam-oriented and also psychedelic... This is a great album, but not quite as exciting or nearly as energetic as they were live last month. Somehow I feel the guys don't really know where they want to go at times, so they just sort of linger on. I must say I'm really looking forward to their next album since the new stuff is excellent! This is the latest issue of Hawkwind magazine put out by Brian Tawn in the U.K. since the late 70s. On this issue Brian writes about the annual Hawkeaster happening at The Gateway in Seaton. This was the third Hawkeaster and the main event was on Easter Saturday and Sunday, but there was also a pre-event on Friday and some fans had already arrived on Thursday. Reading this article makes me feel a bit sad that I wasn't there since it's obvious that Hawkwind and their fans really form a loving family. The main event featured several other bands (Jupiter's Carnival, Flak, System 7, T.O.S.H., Tarantism etc.) besides Hawkwind, who of course headlined on both nights. Steve Hillage from System 7 quested with Hawkwind on Sunday! As always, Brian's writing is intimate, enthusiastic and honest. Sounds like an excellent event! After the pretty long write-up including cool pics there is Damnation Alley where Brian goes briefly though some of the latest HW releases including some super rare bootlegs. Very nice! You can get your own copy by sending Brian £1.80 within the UK, £2.80 to the rest of Europe and £3.50 outside Europe by Paypal to briantawn@aol.com. Warmly recommended for all Hawkfans out there! Also, check out the Hawkfan group at Facebook. 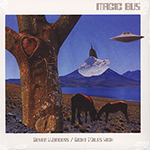 Magic Bus is a progressive psych rock band from Devon, U.K. 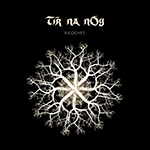 I have not heard from them before and this cool little 7" is their first release on Regal Crabomophone / Fruits de Mer. Since it has an original on the A-side it's on the sister label as FdM is (usually...) reserved for covers only. Magic Bus has two albums and one single out before this release, and I think I just might have to find copies since this sounds very nice. They clearly are highly influenced by the Canterbury scene of the late 60s/70s, especially Caravan comes to mind while listening to their lovely sounds. Fruits de Mer really are great binding with many of my biggest underground psych heros of the last few decades... nick nicely started his career by releasing a couple of great psych pop singles in the early 80s before disappearing into obscurity for years. "49 Cigars" was originally released as the B-side to "Hilly Fields (1892)" in 1982. This strange and mesmerizing single was called "the best psych single since the 60s" by NME and I think they were pretty much right. 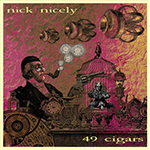 This four-track EP, second for Fruits de Mer by nick, compiles together the original version with a very different, freaky and jammy, extended live version of the same song, a recent, trippy remix of "Belinda" from nick's latest album Space of a Second and, from the same album, the weird and wonderful "Lobster Dobbs" that of course was destined to be released on Fruits de Mer due to its marine title... Well, I love everything this guy has ever done, so it's obvious I also really enjoy this limited edition 7"! Somehow nick's music has a highly hallucinogenic, otherwordly and warped-out nature of its own still maintaining some elements of melodic psych pop, rock and even experimental electronica. This little EP is enough to transport you into another dimension, so let's see what his next album will do... Highly recommended! Now I don't really know that many modern Turkish psych/prog/rock bands, but they have a long tradition in this kind of music since the 60s as a potlach of Western and Eastern musical traditions. Just think of Erkin Koray for example! Anyway, as far as I know, Sis Pus Sus is the first album by this heavy psych prog band from Istanbul. It's obvious that the members have been playing music for a long time since they are very good. The album includes nine original compositions that have just the right amount of ethnic, Turkish elements in melody, rhythm and vibe to make things sound interesting. They also sing in Turkish which sounds pretty exotic as well. Their music is quite progressive but not too difficult to enjoy. There are plenty of psychedelic and spacey parts but also folk elements enhanced by the cello player. Other instrumentation includes just electric guitar, bass and drums but that's plenty for this marvelous band. They also have that groovy element that reminds me of Korai Öröm from Hungary, but without the trance/techno elements and synths. Sometimes I'm also reminded of I won't go through all the tracks individually here, let's just say that there are no fillers and I definitely command you to listen to this album as soon as possible! Viaticum is a rather fresh band from Switzerland. 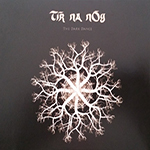 This double vinyl album released in 2014 by the band themselves is their second release. There are eight songs on the 2LP and most of them are pretty lenghty. I like most of the album, but not everything. The first track "Colonize Me Gently" made me think is this supposed to be cosmic or psychedelic rock? Okay, luckily things get much more "out there" on the following, long (13:14) and atmospheric stoner rock jam "Fat Heart", one of my favourites on the album. Viaticum's music changes from heavy, fuzzy stoner rock to melodic post rock/metal and there's also some prog, punk/noise rock and and even reggae influences ("Shittle-12 Hates People") in there to make things even more varied. I like the fact that they tend to be adventurous, but personally I might have edited down the album a little bit. Having said that, at their best Viaticum definitely delivers the deep, hypnotic and heavy stoner rock vibe many people grave for. They can also create those moody, chilled-out moments that are very welcome in between the heavy, intense parts. To my ears the band works best on the instrumental passages, but it's a good thing that there are also a little bit of vocals every now and then. They might use some more effects on the lyrics next time, if you ask me. Sometimes the vocals work out fine like on the beautiful "Hintergrunderfüllung". "Entity" is one of the most straight-forward rock track and somehow reminds me of Monster Magnet. Some of the long instrumental parts have some Swans or GSY!BE vibe in them. There is mainly just guitar, bass, drums and vocals on the album which is fine of course, but for example some spacey analogue synths would have increased the "kosmik" factor. All in all, this is an album worth checking out since I think many readers of my blog might enjoy Viaticum Plays Kosmikrock. Oh yeah, it's also out on CD-R.